If you ask a local startup leader what is holding back their community from growing, chances are the answer you will get is “a lack of capital”. However, in our experience working in nearly 100 markets across the globe, "lack of capital" is nowhere near being the biggest hindrance to startup community growth. In fact, in nascent and developing markets, we have seen an influx of government and strategic capital actually hurt the local ecosystem more often than it helps it. New capital to grow a local startup ecosystem is announced, either by the government or foreign investors. This money needs to be allocated fairly quickly, so investment will go to a select few organizations. Organizations in the local ecosystem immediately begin jockeying for the investment. As a result, these organizations start (1) creating exclusive relationships with others in the ecosystem (these become known colloquially as “tribes”), or (2) vertically integrate (ex. co-working spaces that used to partner with accelerators now create their own accelerators, and those same accelerators start looking for real estate). Almost overnight, a once collaborative ecosystem becomes overly competitive and fragmented. The biggest losers in this scenario? Local entrepreneurs. Rather than having access to many different options at each stage of their startup journey, they now become funneled into “walled gardens” of services (or “tribes” of partners). This fragmentation limits optionality, and creates a less inviting environment for new entrepreneurs to start up. Unfortunately, it doesn’t take an influx of capital to create this scenario. As entrepreneurship becomes more “in vogue” and competitive across the globe, we see growing ecosystems become more and more fragmented every day. The biggest threat to a growing startup ecosystem is not a lack of capital - it is fragmentation and a lack of transparency. It takes a city to raise a startup. In the must-read book Startup Communities, Brad Feld (Co-Founder of TechStars and Foundry Group) describes the dangers of fragmentation as well. According to Feld, "fragmentation kills local entrepreneurship", and a “philosophy of inclusiveness” is a key pillar of a vibrant startup ecosystem. Fragmentation can’t be fixed overnight, but if you can map out your local ecosystem, then you can immediately make it more transparent and inviting for newcomers. In other words, if you can lower the barrier to entry for new entrepreneurs to join your startup ecosystem, you can ultimately help it grow. Hence, we developed the Startup Ecosystem Canvas to help startup leaders map their local ecosystem in a framework that makes it more transparent and inviting for new entrepreneurs. 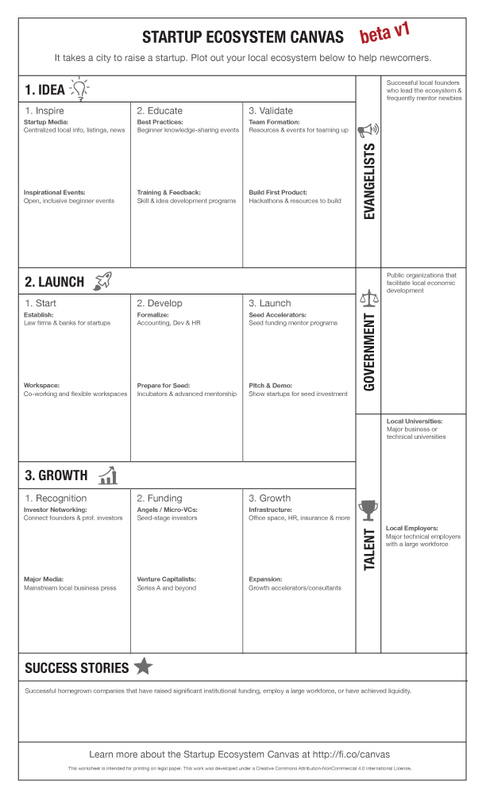 There are two parts to the Canvas: the (1) Startup Ecosystem Canvas Template (below), and the (2) Startup Ecosystem Infographic (see an example here, or read on..). In order to promote transparency in startup ecosystems across the globe, the Founder Institute will create a local Startup Ecosystem Infographic (example) for you, for free. If you would like a Startup Ecosystem Infographic created for your community, simply create your own canvas document using our Google template, and then send us a completed version. So long as your canvas is thorough and follows our guidelines, we will devote the design resources to create the infographic for you ASAP. The aforementioned Startup Communities book by Brad Feld was a major source of inspiration. If you are interested in building a thriving startup community, this is required reading. Feld’s insights mirror the dynamics we have seen in ecosystems of all levels of maturity across the globe. The Founder Institute’s experience launching companies in over 85 cities worldwide, consulting with dozens of Local Directors, several top local Mentors, and many local entrepreneurship organizations. The Business Model Canvas, from Alex Osterwalder. This might be the single-most useful business planning tool available for free today. However, I should note that the Startup Ecosystem Canvas is fundamentally different, in that it is more of a "map" than a "strategic planning tool". The Startup Ecosystem Canvas is built sequentially, so that a community can be mapped in a way that is both clear and helpful for new entrepreneurs. The startup stages listed on the Canvas represent a common roadmap for entrepreneurs to launch a company using resources in their community. There are three Startup Stages, with each stage containing 3 sub-stages of 2 components each. Is the roadmap perfect? No, because there is no single way to launch a startup. Also, it is important to note that Canvas is not meant to provide a rigid roadmap for entrepreneurs to build a company - rather, it is designed to provide a logically organized map of local resources to help entrepreneurs on their journey. What you see here is merely our best attempt to define a common roadmap that represents the median of inputs we have received from dozens of experts active in startup communities. The idea stage is where new and early-stage entrepreneurs get inspired, learn the basics and best practices of building technology companies, develop their skills, validate their ideas with experts, and begin to build their team and product. Startup Media: Startup media typically provide centralized local startup information, listings, and news. For the purposes of the Canvas, these can range from things like local startup blogs and event listing services (ex. Startup Digest and F6S), to local mailing lists, newsletters, Facebook groups, or LinkedIn Groups. Inspirational Events: These are the events that welcome people into the startup community, and inspire those with ideas to think about launching a company. In most markets, this includes events like Startup Weekend, university event series’, idea fairs, and inspirational Meetups. Best Practices: These events are less about inspiration, and more about knowledge-sharing and learning the startup best practices. In other words, these events serve to educate rather than inspirate. Common examples include 1 Million Cups, Startup Founder 101 Meetups, Startup Grind, and more. Training & Feedback: With idea in hand, bootcamps and training programs that provide feedback can help aspiring entrepreneurs build and validate their ideas. Examples include programs like the Founder Institute, General Assembly, Lean Startup Machine, and more. Team Formation: Obviously, team formation for startups is key. While you can argue that all startup events facilitate networking and team formation, this section should only include resources that specifically facilitate networking and early-stage team-building; like CoFoundersLab, FounderDating, and more. Build First Product: Budding entrepreneurs can get help building (or start building) their MVP and first versions of their product through many resources, and the most common ones include hackathons, builder-focused events and workshops, and more. In this stage, entrepreneurs establish and formalize the company, develop their product, get feedback from customers, and prepare for the next step. Establish: This includes resources to help entrepreneurs set up the legal and financial frameworks for their companies, like local law firms and banks that specialize in addressing the unique challenges of startups. Workspace: Co-working and flexible workspaces can provide a good breeding ground for new companies. As we are still in the "Launch-Stage", permanent office space is not included at this juncture. Formalize: As a company and team begin to grow, they often need resources to help them more formally set up their infrastructure (accounting, HR, recruitment, product, etc). This section can include accountants, headhunters, software development houses, and more. Prepare for Seed: Seed funding is a big milestone for most startup teams, and many ecosystems have advanced events and mentorship programs to help teams prepare for seed. This includes Startup Weekend Next and other pre-accelerator events and workshops. Seed Accelerators: The next step in the equation for most ecosystems is a local seed accelerator, like TechStars, Seedcamp, or any accelerator built upon the Y Combinator model. Pitch & Demo: Whether a company goes through an accelerator or not, they often need a way to present their company to a large number of angel investors in order to garner a large seed investment. Pitch events and demo days can provide this opportunity. Here, a startup proves their utility, receives recognition, and scales up. This usually requires funding and other resources to drive growth. Investor Networking: Many ecosystems have ways to connect professional investors with founders, like events, groups, and associations. Examples could include things like Keiretsu Forum, or local venture capital associations. Major Media: The major media can play a role in the startup ecosystem as well, by providing exposure for companies to mainstream audiences. In this section, you should list any major local media channel that champions local companies. Angels / Micro-VCs: These investors focus on the seed-stage, and can include "Micro-VCs" (AKA "Super Angels"), Angel Syndicates, and individual angel investors. Venture Capitalists: These investors typically participate in the Series A stage and beyond, such as institutional venture funds. Infrastructure: With capital in hand (whether via funding or revenue), a company will often need to invest in infrastructure to grow. This includes expenditures like office space, HR, business insurance, and more. Expansion: In many cases, capital-rich companies will also look for new areas of growth, such as new product lines or international markets. Consultants, corporate accelerators, and growth accelerators/ consultants typically can help provide assistance in local markets. To facilitate the startup stages, every ecosystem needs strong supporters like (1) Evangelists, (2) Government, and (3) Talent. Evangelists are people that have taken a leadership position in a community by frequently speaking at startup events, leading or mentoring various startup programs, and generally "paying-it-forward". In Startup Communities, Feld says “the startup community must be led by entrepreneurs”. We could not agree more, so the more evangelists you have that are successful entrepreneurs, the better. Public organizations that facilitate local economic development should not drive a startup community, but they can play a very important support role via policy, funding, events, and more. This can include Chambers of Commerce, Economic Ministries, Public Innovation and Economic Development organizations, etc. In Startup Communities, Feld classifies supporting organizations like these as the "feeders" to a startup ecosystem - but not the "leaders". Local universities and employers can have a large impact on a local startup ecosystem by attracting, developing, and retaining a high quality pool of local talent. Local Universities include any colleges or universities with prominent technical or business programs. Local Employers include any major companies that employ a large local workforce. When you add up all the Startup Stages and the Supporters, hopefully the output is successful homegrown companies. "Successful" is obviously a relative term, so depending on the maturity of a given ecosystem this could include homegrown companies that have achieved significant milestones like raising institutional funding, generating significant revenue, employing a large workforce, or achieiving liquidity. Each resource should only be listed once on the Canvas. This is the most important guideline, because a Canvas with resources listed multiple times will become unwiedly, and ripe for abuse (I have seen many organizations basically try to list themselves in every category - um, not helpful!). When assisgning an appropriate category for a resource, simply choose the earliest category that the resource primarily serves. Also, if one resource has several "brands" (ex. an accelerator that has a separate co-working space or free event series), it is perfectly appropriate to list out those brands as separate resources. List all resources in alphabetical order. This helps deter favoritism and keeps your canvas as objective as possible. Open up contributions from your local community. Every canvas we have made has gotten contributions from many different sources in the community, and we have even released early versions of the canvas' on local media, mailing lists, and Facebook groups to get feedback as well. In our experience, releasing a somewhat complete version for community feedback is the best method, and no matter what, you will never be able to make everyone in your ecosystem happy (so don't try). The Startup Ecsosystem Canvas was created to make your ecosystem more transparent and inviting to newcomers. Keep this goal in mind. After you map out an ecosystem with the Canvas, will anybody care? How can you spread it around your ecosystem so that it reaches new entrepreneurs and starts to drive transparency? To tackle this problem, we decided to create a Startup Ecosystem Infographic for cities with completed Canvases. Using infographics like the one below, we have been successful in getting distribution across local media, mailing lists, groups, and social media - with extremely high virality. People really do love their infographics :). See some examples of press we have received in Croatia, Istanbul, Karachi, and Dhaka, and see all the Ecosystem Infographics at http://fi.co/canvas. We have seen first hand how fragmentation can hurt a startup ecosystem. In order to promote transparency in startup ecosystems across the globe, the Founder Institute will create these local infographics for you, for free. If you would like a Startup Ecosystem Infographic created for your community, simply create your own canvas document using our Google template, and then send us a completed version. So long as your canvas is thorough and follows our guidelines, we will devote the design resources to create the infographic for you ASAP. Also, I'd love to hear your feedback on the project. I consider the Startup Ecosystem Canvas a perpetual work in progress, and this is merely v1. In soft-launching the project in a few isolated markets over the last few months, the feedback I have received has been overwhelmingly positive, but I fully expect to make more changes. You can leave private feedback here, or join the discussion on Twitter using the hashtag #ecosystemcanvas. Jonathan Greechan is a Partner at the Founder Institute. Follow him on Twitter @jonnystartup.